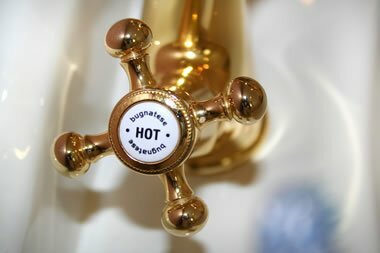 This short guide has been written for people managing hot and cold water systems in buildings and other facilities and gives a brief overview of where, when and how to check water temperatures and perform other routine tasks associated with the control of Legionella bacteria in hot and cold water systems and Legionnaires’ disease. Why are hot and cold water temperatures important? Legionellosis is a condition caused by Legionella bacteria, and it affects the respiratory system. The more serious form of the condition is known as Legionnaires’ disease which is a serious infection of the lungs. It is usually caught by breathing in small droplets of contaminated water. Legionella bacteria can spread in man-made hot and cold water systems if the water temperature allows this to happen. The prime temperature for the bacteria to proliferate at is between 20 – 45 degrees Celsius (68-113 F). Hot and cold water temperatures should be checked monthly at various points throughout the water system. These temperatures should then be recorded so they can be monitored over time to help improve the management of legionella risks and the control processes in place. These records should be kept safely for at least five years. Using an accurate thermometer, check the water flow from a chosen hot tap. When doing this for the first time, the tap furthest away from the calorifier/water heater/boiler should be chosen, this is sometimes called a sentinel outlet. Other representative points can then also be checked in a chosen pattern, eventually repeating the pattern so different taps are checked monthly. If thermostatic mixing valves (TMVs) are fitted, these ensure the temperature never exceeds 44 degrees Celsius primarily to prevent hot water scalding. In this case, the hot water inlet to the TMV should be checked instead of the hot taps. Again, a minimum of 50 degrees Celsius should be recorded in this instance. With a TMV fitted water temperatures at the hot tap should not exceed 44 degrees Celsius. On a monthly basis check the water flow and return temperatures at water heaters (calorifiers). One way of measuring these temperatures is to use a surface temperature probe. The outgoing water should be at least 60 °C in order to kill Legionella bacteria. Keeping accurate records is of paramount importance. Make sure it is clear which taps or tanks were checked each time, where they are, who checked them, when they were checked, and anything that was amiss and what was done to remedy it. This course is ideal for facilities managers, caretakers, building managers, plumbers, maintenance and engineering contractors… in fact anyone with responsibility for the monitoring, inspection and maintenance of hot and cold water systems.